Perhaps the most devastating, non-scriptural argument against Evolutionism and for the Truth of the Bible and Creation is that of the Second Law of Thermodynamics. The Second Law states that all things in the Universe tend to disorder - or as it is called by scientists, entropy. Scientists say that entropy rises and can never decrease. By this they mean that things will always get more disorderly. This is a scientific fact that can be seen in our everyday lives. Examples of this phenomenon include: a child's room will become more disorderly over time, but will never spontaneously clean itself up; buildings will crumble and decay, but will not repair themselves; people, who do "repair" themselves in the short term, will nonetheless grow old and more physically feeble in the long term. When we consider the Second Law of Thermodynamics, we can see that science is in agreement with the Truth of the Bible - as it must be if science is to be of any value at all. Not only can we see the Second Law in action throughout the Bible (for example, the moral decay of Sodom and Gomorrah) but the very origin of entropy - the subject of the Second Law - is given to us in Genesis. In Eden, all was perfectly ordered. There was no entropy. When Man ate of the Tree of Life and was cast out, he was cursed with entropy. Since then, entropy has continued to rise and will do so until the end of time. 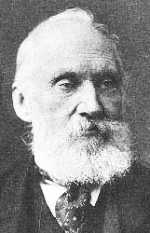 Sir William Thomson (Lord Kelvin), noted Creation scientist and divinely-inspired discoverer of the Second Law. If it weren't for the Word of God, Man would not know of the Second Law. Sir William Thomson, the noted 19th century Christian scientist and the discoverer of the Second Law, found the inspiration for his discovery in the following line from the Bible: "all of them shall wax old like a garment" (Psalm 102.26). This scientific truth was revealed to Man via the Divine Truth of the Bible. The Second Law is just that - a Law. It applies everywhere in the Universe, without exception. Unlike mere theories such as Relativity and Evolutionism, the Second Law has been proven to be true and no reputable scientist would ever suggest that it wasn't. Amongst reputable scientists, suggesting something violates the Second Law would result in being considered grossly ignorant, a kook, or a charlatan. Even the US Patent Office has a standing order to ignore patent applications - such as those for perpetual motion machines - that violate the Second Law (the only such a priori restriction that the Patent Office makes) since it is known that such devices would just not work. To put it bluntly: there is just no getting around the Second Law of Thermodynamics. Evolutionism, however, does try to get around it, and that is why it is bad science. Evolutionism claims that life gets more complicated over time - that its entropy decreases. Specifically, it claims that the minuscule amount of genetic information that would have been in the first Godless proto-lifeform would have increased through the addition and ordering of random mutations. Let's consider this proposal: The genome (the sum total of all genes in Man) contains information in the form deoxyribonucleic acid (DNA) molecules. It is the order of this DNA that creates its informational content - a specific ordering of DNA molecules makes up a gene that produces a protein that in turn makes up part of our physical form. For information to be added or changed, it would be necessary for an addition of ordered DNA or reordering of existing DNA to occur. In other words, a decrease in entropy in direct violation of the Second Law of Thermodynamics. Random mutations cannot add the ordered information that would be needed to turn a bacteria into a man. This is just a simple fact that can clearly be seen from looking at the Second Law. However it gets worse for Evolutionism, since - as was shown in the 1940's by Claude Shannon of Bell Labs - the addition of randomness to the genome increases the genome's entropy. This means that the exact opposite of what Evolutionism proposes is actually happening - we are getting more disorderly. The science of Creation, on the other hand, is in complete accordance with the Second Law. Creation science teaches us that Man and God's other creations were all created with informationally dense, uncorrupted DNA. Adam had more genes and more robust genes than you or I have. This is evident in the extreme age that antediluvian men were able to reach which was due to their genes being free of the deleterious mutations that lower life expectancy today. Over the ten thousand years since Creation, our genes have degraded due to the entropy of randomness and we now suffer the consequences of the curse of entropy. Genetic Entropy: As time passes from the Fall, genetic information becomes more corrupted, leading to a change in the "gene pool" of populations towards ever-less-perfect creatures. This deterioration is called "micro-evolution" - not to be confused with the impossible "macro-evolution" that the false philosophy of Evolutionism promotes. All current species formed via this process of micro-evolution from the animals that Noah took aboard the Ark. Furthermore, the very existence of the Second Law - and other so-called "Laws of Nature" such as the Laws of gravity and motion - is in and of itself a powerful testament to the existence of God. While Man may author the particular wording of these Laws that we see in textbooks, or express them in logical systems of his own devising, these Laws were not created by Man. The metaphysical reality of these Laws is Universal and Man merely represents them in his writings. The existence of these Laws compels us to ask the rhetorical question: "How can there be Laws without a Lawgiver?" To which we reply: "There can't be." So if Man is not the Lawgiver, then who is? Who could have the Power and Authority to proclaim Laws that affect the entire Universe? The inescapable answer is: "God. That's who!"